G. Peter Jemison is a Heron Clan member of the Seneca Nation of Indians. He is the Historic Site Manager of Ganondagan State Historic Site, the site of a 17th century Seneca Indian town located in Victor, New York. Peter is a professional artist, filmmaker, curator and author. In 2003 Peter received an Honorary Doctorate of Fine Art from Buffalo State College. Peter is the co-editor of TREATY OF CANANDAIGUA 1794, 200 Years of Treaty Relations between the Iroquois Confederacy and the United States. 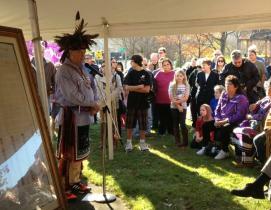 He served as the co-chairman of the Canandaigua Treaty Commemoration Committee in 1994.